Tonight, from 7 p.m. to 9 p.m., April 19, Eversource has a “Gas Expansion Open House” for anyone interested in getting natural gas service — especially from any of the new gas lines planned for installation this year in Darien. The open house takes place at the Mather Community Center, 2 Renshaw Road. Use the lower parking lot off of Renshaw Road for the easiest access. Natural gas service is less expensive than warming a home or other building with heating oil or electricity. Money, time and effort must be spent to make the switch, and Eversource has various programs to help with financing. As gas lines have been expanded, Darien officials have switched town-owned buildings to natural gas in order to save money. Contractors working for Eversource have begun installing gas lines at two spots in town — on Ledge Road and Greenwood Avenue. Later in the project, gas lines will be installed on Hoyt Street (state Rt. 106) from Greenwood Avenue north to the New Canaan town line (about 1.3 miles) and on West Avenue from the area of Brown Street east towards Leroy Avenue (about 1.8 miles). Eversource representatives will explain the project, the benefits of natural gas and the process of connecting your home. There will be multiple “information stations” covering topics ranging from the basics of natural gas, to finding a contractor, to financing. Potential customers will be able to see neighborhood maps showing our proposed construction schedule. And yes, they’ll be able to sign-up for natural gas service. First Selectman Jayme Stevenson has been invited to the event. Please note: You should not purchase or install, or incur a non-cancellable obligation to purchase or install, gas-fired equipment or related work in anticipation of receiving service as part of this letter until we have started to install necessary piping, meters and other facilities on your property. *“Free” means no additional customer cost based on the new customer being charged the approved CT gas expansion rate. 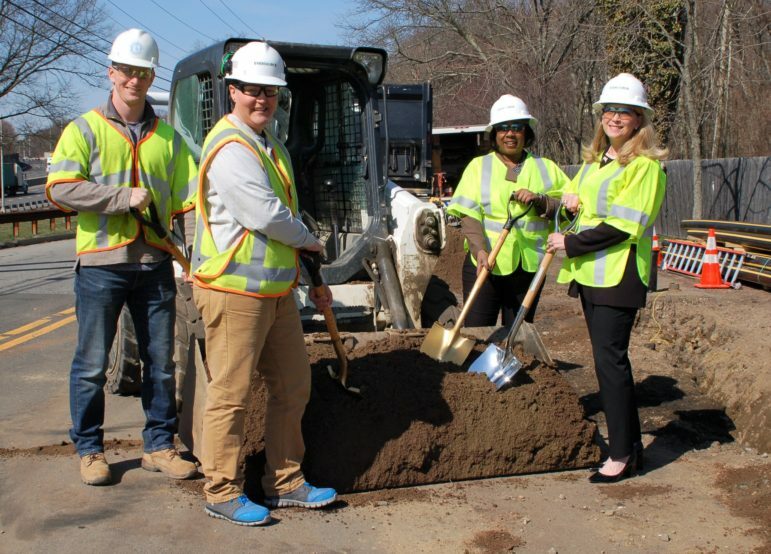 Selectman Jayme Stevenson (right) marks the start of natural gas expansion work in Darien with (from left) Matt Johnson, Feeney Bros. Utility Services; Heather Adrian, Eversource construction supervisor and Tracey Alston, Eversource community relations representative. Due to construction work for the installation of natural gas mains in downtown Noroton Heights, expect delays Thursday, June 7 on West Avenue between Hollow Tree Ridge Road and Edgerton Street and the closure of Edgerton between West Avenue and Heights Road. Darien police announced the road closure and delays the same morning. Announced plans to close a stretch of Hoyt Street between Camp Avenue and Woodway Road have been CANCELLED due to expected rain, and the rain date of Saturday, Aug. 25 will be used instead, Darien police announced.